In Young v. United Parcel Service, Inc. 575 U.S. __ (2015); 135 S.Ct. 1338 (2015), the U.S. Supreme Court addressed what types of accommodations employers must make for pregnant workers. The employee-friendly decision was one of the most important employment cases of the 2014-2014 Term. 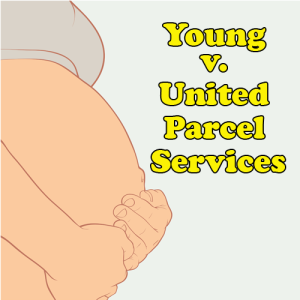 The Pregnancy Discrimination Act (PDA) provides that “women affected by pregnancy, childbirth, or related medical conditions shall be treated the same for all employment-related purposes…as other persons not so affected but similar in their ability or inability to work.” In case before the Supreme Court, Peggy Young filed suit against her employer, United Parcel Service, Inc. (UPS) for failing to provide her with the same accommodations as it provided to non-pregnant employees who were similar in their ability to work. As a result, Young was forced to take an extended, unpaid leave of absence, during which she lost her medical coverage. After exhausting her remedies with the Equal Employment Opportunity Commission (EEOC), she filed suit under the PDA. The district court sided with UPS, holding that the company’s decision to deny Young’s lifting accommodation turned on “gender-neutral criteria.” The Fourth Circuit Court of Appeals affirmed, holding that UPS had crafted a “pregnancy-blind policy” by limiting accommodations to three specific categories. By a vote of 6 to 3, the Supreme Court vacated and remanded the pregnancy discrimination case back to the Fourth Circuit. In so ruling, the majority largely rejected the arguments raised by all sides. The Court also refused to give deference to the EEOC’s pregnancy discrimination guidance, which was published in 2014 after the Court granted certiorari. It stated that an employer may not treat pregnant workers differently from employees who are similar in their ability or inability to work based on the cause of their limitations. We believe that the plaintiff may reach a jury on this issue by providing sufficient evidence that the employer’s policies impose a significant burden on pregnant workers, and that the employer’s ‘legitimate, nondiscriminatory’ reasons are not sufficiently strong to justify the burden, but rather—when considered along with the burden imposed—give rise to an inference of intentional discrimination. On remand, the Fourth Circuit must consider the question: “When the employer accommodated so many, could it not accommodate pregnant women as well?” Accordingly, the plaintiff will have an opportunity to revive her discrimination case.